How many blown gun incidents, if any are reported during SASS matches? I’ve seen two in fifteen years, a Colt with a bad handload threw the top strap and half the cylinder and a shotgun with split barrels. Though dramatic in the moment these incidents were statistically insignificant given the amount of fired rounds I’ve been present for since I joined in 2003. One in 19 years - A pard had an ejected .38 shell land in the open port of his 97 (was on table facing up), then boom when loaded and fired. No one was hurt. One that was terrifying and 2 others that were minor in comparison in 19 years. The shooter's pistol blew up in his hand. Parts flew everywhere, narrowly missing other shooters, and by some miracle no one was injured. I can't remember the reason for the incident. 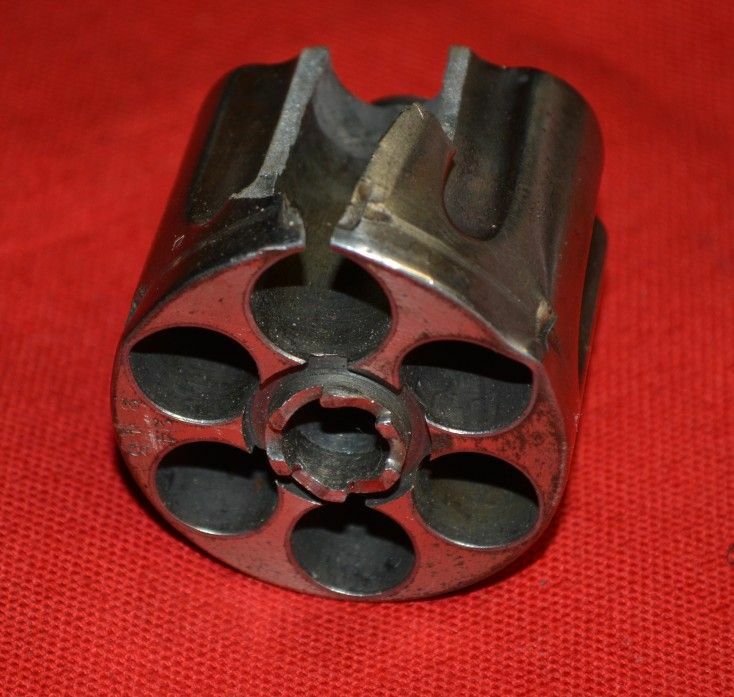 I once saw the top of a cylinder and the top strap blown off of a Colt by a bad handload. But that's the only one since 1999. Only two in three years. One an out of battery which a piece of brass caught the shooter with a graze. One WB with a 1911 letting go (over charged round) - no one hurt but had the recoil spring fly past my head. Shooter and TO were alright other than a big scare. None in 12 years at the matches that I’ve attended. Saw a Henry chain fire when the follower slipped out a shooters fingers while loading, also saw a 97 receiver crack when the flag hit a shell that was part way in the loading port. Seen a few bulges from stacked bullets but no "unscheduled rapid disassembly" as we call it in my industry when a piece of equipment blows up. I know this is a serious subject but THAT'S funny. Once. Around 2001. Double charge of Clays blew up a Schofield. No injuries. I believe that was at EOT 5 or 6 years ago. I remember getting the call on the radio to keep the gate and road clear so the ambulance could get through. I believe he was from Utah. Two out of battery discharges where the rifle round didn't chamber and the shooter was looking down into the action while trying to lever the round into the chamber. One didn't get hurt. The other resulted in a concussion and fall. That's why I tell shooters to put it down if there is a jam or squib. I'd rather give them a re-shoot if the gun was clear than risk an OOB. "unscheduled rapid disassembly" as we call it in my industry when a piece of equipment blows up. I "popped" a chamber on my 47 Walker with a 285gn conical and a full chamber of black powder (not sure if I accidentally filled it with 4f or not). I took a buddy of mine to the range with the same Walker with a different cylinder and it chain fired on him. The first time he ever shot a cap and ball, first round, chain fire...lol... Scared the hell out of everyone and the only chain fire I've ever seen. Had a member with a Henry Uberti rifle fire the rounds in the magazine tube when the follower was accidentally dropped. Had a buddy completely blow apart a Rossi mule ear coach gun. Blew out the complete side of the chamber. He was shooting light loads with Blue Peters Hulls and we think he had a base wad separation. Must have lodged right in front of the chamber. Seen an out of battery discharge of a 66 Yellow boy. Stout 45 Colt loads bent the lever and hurt the shooters hand/wrist. after either the right or left barrel was fired... Never damaged anything, but was rather disconcerting to more than one TO! He finally won a new shotgun and retired that hunk of junk about 1993. I've see two in 25 Years playing CAS. Two more if you want to count Bench Rest (Naw). 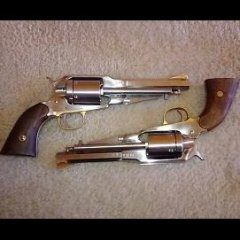 One was mine, Bulged and cracked a Uberti .45 Cylinder from an overload. Lesson .... do not make adjustments to your Dillon with powder inna hopper. Tother one was a vicious magazine discharge in a Uberti 1866. Shooter had a habit of running his .38 with pointy bullets. Powder burns only. Two in 15 yrs. 1st was a top strap from 3 bays down went whizzing over my head, sounded like a jet powered boomerang. 2nd was a 1911 with some sort of OOB discharge which blew the mag out the bottom & both grips off. Both very scary. Edit: I bent the lever on my '73 a mite bit. A little rap on the fingers but nothing major. Edited January 16 by Yusta B. 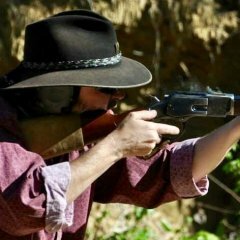 A whole bunch of years ago a shooter had an out of battery discharge in an Uberti 1873. The lever slammed forward and broke, leaving him with a sore hand. A 44-40 Merwin Hulbert that let go. Not sure if it was fired with Black Powder or smokeless. The owner recalled saying something like "I guess I should not have fired it with Smokeless powder, but later he seemed to think it had occurred with a BP load. I keep the blown up cylinder on my reloading bench. The same Merwin Hulbert is at the top of this photo, with a new cylinder and new top strap. Ever notice the cylinder lock is center chamber on these? That makes for one hell of a weak spot compared to Colt's off-set cylinder lock location. Damaged like bulged BBL, bent lever etc, 3-4. 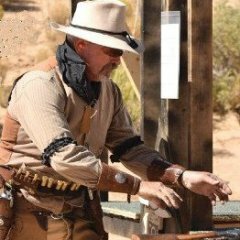 I was shooting next to the shooter at EOT that year when he blow up his 45-70 Marlin Lever Action Rifle when the wooden forearm exploited I have wooden spiliters in my left arm for weeks. He was very lucky that day. He spent 8 hrs in the Emergency Room at the Hospital. I have seen two issues in 22 years of SASS Competition. Never a blowup but saw the same shooter with OOB twice. He put his lever safety back in I hope. I saw this one personally... right at the end of my arm at a match in June, 2016. 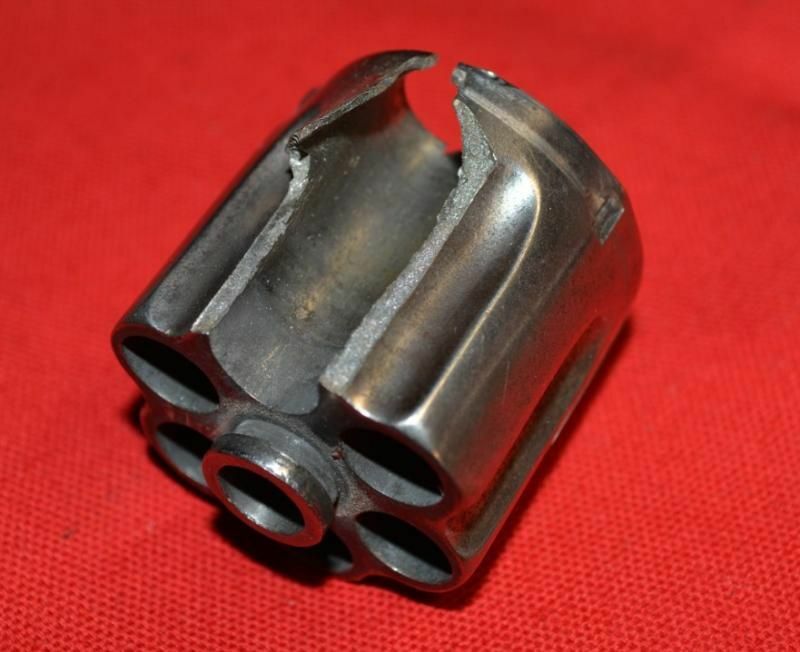 Most likely a double charge of Clays, .38-40 ArmiJager, no injuries. Hodgdon's max load is 5.5 grains, and my load is 4.2, so a double charge would have been 8.4, or 52% over max. The kaboom recocked the hammer and rotated the cylinder when it blew out, hence the split chamber not being under the hammer in the pic. I was TO for a double charge or OOB in a 1911. Shot the magazine innards out of the bottom, blew the grips off and the case was circumferentially burnt through ~75% at the head. Stopped a shooter from trying to force a round to chamber in his rifle. He had a squib that lodged a bullet in the chamber that went undetected at a previous shoot and he did not clean it between shoots. Could have been interesting. Probably a few more that I don’t recall. Seen about 8 rifles, pistols and shotguns damaged to point of needing repair due to improper loads at SASS matches. Four of these from one shooter. One trap shooting accident (probable overcharge). A couple of shotguns blown due to barrel obstructions. A few at public ranges blown up, almost always improper loads, but sometimes incorrect ammo. Running instructional and public ranges and hunter safety classes, you get to see a lot that you wish you didn't. I was spotting for a shooter and as he fired his '97 parts came flying out the loading port. No one hurt but the shotgun needed a new bolt assembly. I was just behind the firing line to the right of the shooter and saw the parts fly by. Only event I witnessed in 19 years. 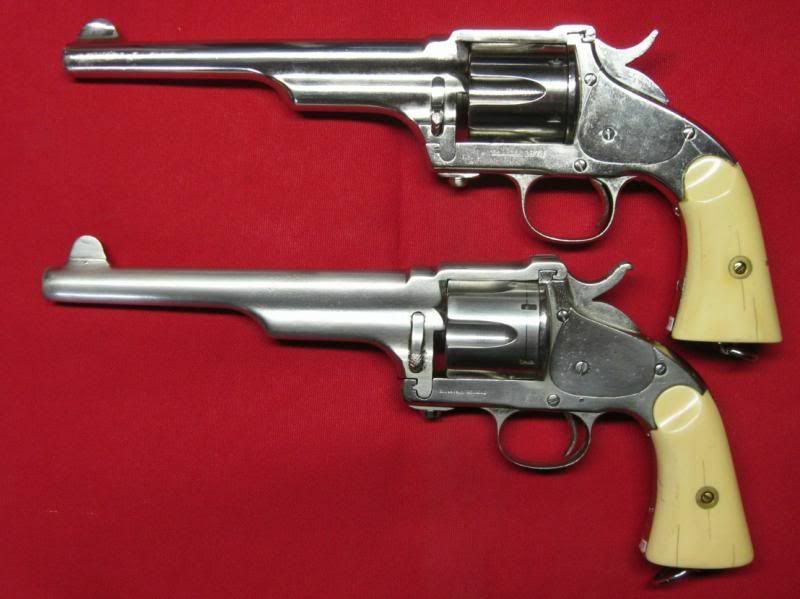 Quite awhile back: Original New Model #3 S&W in .44-40. Shooter used some ammo he got from an "amateur" handloader! First two rounds barely made it ten feet from the muzzle. Third round blew the cylinder and top strap. I was NOT allowed to examine either the gun or the remaining ammo. With those two near-squib loads, it might have been "premature shotstart" with the bullets not retarded against movement until the smokeless powder came up to stable ignition. With the bullet out of the case and into the forcing cone before pressure buildup, pressures would have gone out of case rupture strength. Other possible cause: double charge. Pity, there weren't that many .44-40 NM#3's made! Second case was a Colt's clone, .45LC. Blown cylinder & top strap departed. Examined remaining ammo, and found very little crimp and tension on the bullet by the case. Probable cause, as mentioned above, premature shotstart with the bullet lodging in the forcing cone before the rest of the charge started burning steadily, Once the bullet stuck, it requires a great deal more force to get it moving again. Remaining powder then takes off and brass can't handle the pressure, ruptures, allowing flame to cut the chamber walls, and off goes the top of the gun. Moral on that one: be sure to have enough case tension on the bullet (don't over expand the case mouth), and CRIMP! CRIMP! CRIMP! Use a roll crimp! Twenty years in May. I've only seen one gun blown apart. It was a 1911 in a WBAS match. Oh, I just remembered the Marlin SG's "unscheduled disassembly" where the bolt broke the shooter's nose.